Catch the British pianist play his boogie-woogie best at Moods. 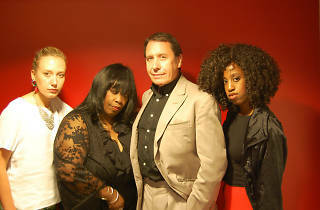 Anyone who has watched UK television over the past 20 years or so will have stumbled across live music show Later... with Jools Holland (or its New Year’s Eve incarnation, Jools’ Annual Hootenanny). Though he’s an unlikely-looking king of cool, the former Squeeze pianist’s considerable musical talent has audiences in awe while every star worth his salt – whether up-and-coming or long established – wants to grab a sought-after spot on the show. His vast and well-travelled career has seen him collaborate with a who’s who of music, from Eric Clapton to Mel C, Nick Cave to The Baseballs. This gig at Moods sees Holland perform a boogie-woogie programme along with three special guests, the singers Mabel Rae, Ruby Turner and Louise Marshall.